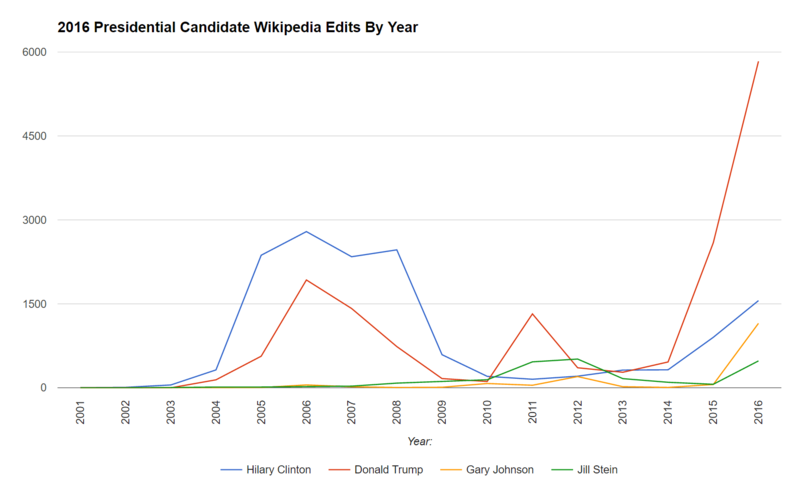 In February, I made a chart that visualized the Wikipedia page edits for each of the candidates. I won’t get into why Wikipedia page edits might be an insight into something deeper here. I’ll let you decide what they mean. Next, this chart shows the number of Wikipedia edits by year. After iPage decided they wanted to charge $400 a year for a website I do not profit off of in any way, I decided to switch over to a much cheaper host (and thus far, much more responsive one): Namecheap. The site should be back as it was but if anyone sees anything while browsing, please let me know! Let’s say you run a NYC firm of 40 people. Based on data from the USDA, the average American drinks 3.9 cups per day. Assuming your employees drink about that each day, they would drink 280 gallons in a month. After careful calculation, you tell the water delivery guy to forget your number. The price of filtered tap over 3 years is less than the cheapest month of office delivery. Of course, this example only specifically applies to businesses located in NYC. However, whereas the price of tap decreases among most other municipalities, the cost of water delivery remains practically the same. Out of sheer curiosity, I compiled the revision history data from Wikipedia for the 11 leading presidential candidates. The resulting chart could display which candidate is most popular, which candidate has most to hide or nothing at all. It’s all up for your interpretation! Note that for this graph, the 2016 edits are projected based on how many have been made so far this year (as of February 9th, 2016). Below, you’ll find four different guides on how to see and save your old Facebook messages. If you follow these guides, you’ll be able to see your first Facebook message with someone (as long as Facebook hasn’t deleted it), save all of your messages for safe keeping or simply take a stroll down memory lane. Last tested on February 5th, 2016. If you’d like the quickest, easiest, way to see your first message, follow this guide. However, you’ll need to remember what you said or one of the keywords. If you want an easy way to backup all your messages and an easy way to see your first message if you don’t remember how it went, follow this guide. However, this method lists all your messages in one giant page so you’ll have to do some sifting to find it. Additionally, Facebook makes you wait up to a day to receive the download. This method is the best if you want to see your first messages with a specific person, don’t remember how it went and don’t fell like waiting up to a day for your download. I personally think most people will choose this method because it’s still easy as long as you follow the steps carefully. If you want to backup and save your messages with someone in a clean PDF form, this is the guide for you. Be prepared to work for it though, as it may take quite some time if you wish to save a lot of messages. Search for the topic you were talking about when you first started talking using the search bar. Find the conversation and click into it. 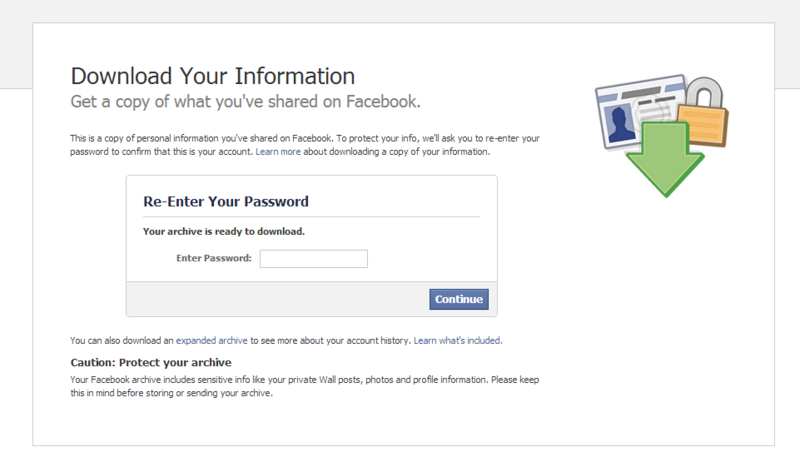 Enter your password and then wait for Facebook to email you a download link. Re-enter your password and then wait for it to finish downloading. Open the file you downloaded (you will have to extract/unzip it) and click into your username. You’ll see an html file called “index.html” – click that. When it opens, click messages and there’s everything! Hopefully your computer is powerful enough to open up ALL your Facebook messages at once! Ctrl (or Command) +F is your friend. A hint to find this magic number is to go to the normal “Full Conversation” on the desktop/normal site and as you scroll up, you’ll quickly see a number at the top next to “Loading Older Messages…” That’s your number. You might still have to click “See older messages” a bit to get to the first few, but it’s nothing compared to going through 50,000+ messages first! If you’re like me and you want to save every single message with someone because you don’t trust Facebook’s servers or if you just want a clean way to view your messages with someone to reminisce, you’re in the right place! No matter the reason, here’s my best attempt to explain how to save them all! Make sure you have a good computer if you plan on doing this method! To start, open up a browser like Google Chrome that has a print to PDF function. Download an auto mouse clicker app such as “Free Mouse Auto Clicker” for Windows or “Auto Mouse Clicker” for Mac. Script your computer to systematically click the “See older messages” button and repeat after a second or so. This is where you’re going to need a good computer because many browsers crash once the RAM is maxed out. After the computer starts to slow down, which it will, stop the auto clicker, click print and choose save as PDF. My computer can usually make it through a few months of messages before you need to make a PDF. Make sure to check images and uncheck headers if you’re using Chrome. Right click the ”See older messages” button again and click “open in new tab.” Close the full and slow tab. Now all you have to do is repeat the process! I wish you luck, as this is the hardest method of saving your messages, but the most rewarding. If you need help, I’m always here! Just don’t ask about how to use the Macro app. You just have to Google around or read the help document if you’re stuck. If this post helped you, why not like my Facebook page or follow me on twitter? It’s the greatest thank you I could ask for! The like button is on top! 30 Rare Used Cars With An MSRP Below 30K. Using data from the NHTSA, I’ve compiled a list of the rarest/worst selling (depending on how you look at it) cars since 2000. Note that these prices reflect the price of the car in the year they were produced. Today, many of these cars can be had for under 10,000. Hope it helps someone! There are hundreds of car models on the market, each offering differing safety features, legroom, prices, features, mpg, etc. Narrowing that list can be incredibly challenging, and time consuming – especially if you are open to buying new or used cars. While the IIHS tries to compile a list of their recommended safest cars each year, they end up recommending about 150 cars. For anyone searching for a car, that number is overwhelming. On top of that, the IIHS doesn’t seem to take their own driver death rate into account when adding vehicles. Many have driver death rates that are above average. Fed up, I created a list of all the cars 2003 and newer that have both excelled in safety tests (cars that have a score of 55 or lower on informedforlife.org) and a driver fatality rate lower than the average of 28 people per 1 million cars sold (using data from informedforlife.org and iihs.org). Hopefully this helps someone at least narrow their list a bit! Of course, with cars being released all the time, I will continually update this post as new data is released. Currently, this data set is up to date as of: 9/27/2015. So what does this mean? Well, it could mean that processed milk is more watery than milk right from the cow and thus, perfect for dunking. Unfortunately, I don’t own a cow to test that theory. It could also mean that milk replacements are more dense than milk. I also don’t think Silk and other companies should make their drinks more watery. I like the creaminess of Almond/Cashew milk.